The Italian Serie A match between Torino and Parma is one of the most intriguing of the penultimate round and one thinks that betting on over two and a half goals is a smart play. Torino is adjacent to Parma on the Italian Serie A ladder, with the former one point and one rung ahead of the latter. Torino is sixth with two rounds remaining and sixth is the cut-off point for UEFA Europa League qualification. Three teams are breathing down the necks of Torino and Parma so there is a lot for which to play over the next two weeks. 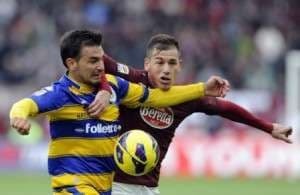 A draw is unlikely to cut the mustard for either Torino or Parma. Therefore, one can expect Torino to play for the win – as one would expect of a home team – and Parma not to sit back and hope for any kind of positive result. One thinks that Torino and Parma will play positively throughout the game and that leads one to think about lots of goals. The Italian Serie A goals statistics of Torino and Parma do not really support a bet on over two and a half goals even though the reverse fixture produced four goals but this is a situational play because of the circumstances in which the sides find themselves. Ladbrokes is offering odds of 1.83 that the Italian Serie A match goes over two and a half goals and that is more attractive than backing Torino, which has won five and drawn one of its last half a dozen matches, to collect maximum points. Torino’s unbeaten run has been facilitated by an incredibly weak schedule, the total opposite of Parma’s recent run of tough fixtures. Appointing Clarence Seedorf as manager was a big gamble that Milan took and it appears to be paying dividends. Milan has climbed to eighth on the Italian Serie A ladder and European football next season is not out of the question. One thinks that Milan will need to win its two remaining Italian Serie A games to have a chance of making the UEFA Europa League, starting with its assignment away to out-of-form Atalanta. Atalanta was Italian Serie A’s form team two months ago but losing has become a habit for the Bergamo-based side lately, with it collecting only one point from its last five matches and falling out of contention for a top-six finish. Milan made it six wins from its last seven Italian Serie A games by beating Internazionale 1-0 in the San Siro derby and its only recent slip up was its forgivable 0-2 loss at Roma. Bookmakers may be being a bit cheeky in quoting Milan odds on across the board to win at Atalanta but the away team’s Italian Serie A season is alive whereas the home side’s campaign is dead. Milan is available at odds of 1.67 with several bookmakers, including Betfred and Coral, and it won the reverse fixture by a comfortable 3-0 margin. Finally, Verona is not out of the UEFA Europa League chase and it hosts a Udinese team that has nothing for which to play except professional pride. Verona won the reverse Italian Serie A fixture 3-1 in January and, although its form has tapered off in recent months, it has won two of its last three home matches to nil and it netted three goals in its high-scoring loss to Fiorentina. Udinese’s away record is bad, with the Udine-based side beating just three of the bottom four – Bologna, Livorno and Sassuolo – on the road. Verona is trading at odds of 2.20 with Bet365 and BetVictor, odds that appear somewhat generous when one considers that the home team has every right to be a shade of odds on.